It’s hard to imagine forgetting a child in the backseat of a car on a sunny, scorching 30 degree afternoon. But every year, there’s news of a child being left in a car, where the heat rose to dangerous, sweltering temperatures. Sadly, this tragic turn of events can happen to any parent or caregiver who has a temporary lapse of attention or disruption of a daily routine. Cars and vans heat up quickly. Even if a window is rolled down two inches, when the outside temperature is in the low 20s (Celsius), the temperature inside a vehicle can reach deadly levels in only 10 minutes. Children's bodies overheat easily, and infants and children under four years of age are among those at greatest risk for heat-related illness, since their bodies absorb more heat on a hot day than an adult. 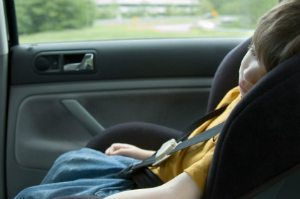 When left in a hot vehicle, a young child's body temperature may increase three to five times as fast an adult. High body temperatures can cause permanent injury or even death. Prevention is key to keeping children safe in the summer months, and year-round. By incorporating the following small measures into your daily routine, you can help prevent this type of tragedy from happening. Make sure your childcare provider knows to call you if your child has not been dropped off at the usual time. Always place an item (purse, bag, etc.) in the backseat so that you have to open the door every time you leave the vehicle. Keep a large stuffed animal in your child’s car seat when it is not occupied. When your child is in the seat, put the stuffed animal in the front passenger seat. This is a visual reminder: any time the stuffed animal is in the front seat, you know your child is in the back seat. When you arrive at your destination, avoid any distractions including talking on the phone or texting while you exit your car.